The 1870s was the decade when tourism first became an important factor in the South Coast’s economy. An important element in this development was the area’s growing reputation as a health spa. 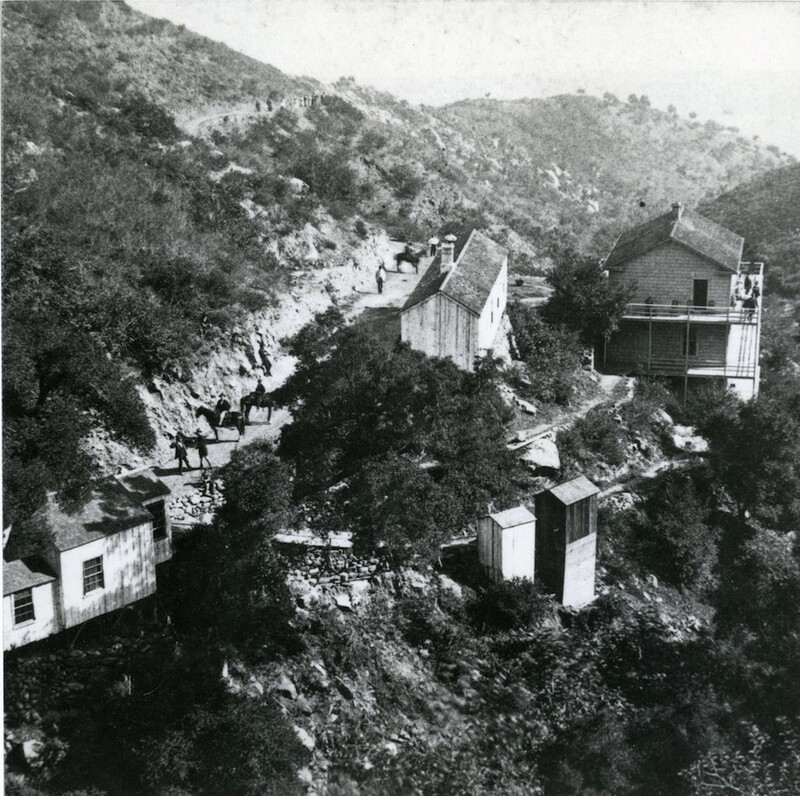 In addition to the mild climate and soothing ocean waters, the region boasted a number of mineral hot springs, the most famous of which were the pools just above Montecito. Travelers from the world over came to Santa Barbara seeking a cure for their aches, pains, and illnesses. Wilbur Curtiss initially developed the site as a resort. He arrived in Santa Barbara in the late 1850s, in broken health. Reportedly, by drinking the water and bathing in the springs he was rejuvenated in six months. Curtiss bought the property, with plans to build a 46-room hotel with a saloon and two bathing facilities, but he found few investors. The road to the springs was steep, treacherous, and tended to wash out in storms. Initially, facilities were primitive. One newspaper described them as “redwood shanties.” Even these structures were swept away by fire in 1871. Curtiss then built a three-story hotel with a dining room, but business remained fitful and in 1877 the county sheriff sold the property out from under Curtiss. During the ensuing decade the springs had a number of owners. In 1878, room and meals cost $2.00 a day and this included unlimited use of the springs. Water temperature varied from spring to spring, from a low of 60 degrees to a high of 122 degrees. It was claimed the waters were of great value in curing Bright’s disease, liver and bladder troubles, gout, rheumatism, and any number of skin diseases. For those who did not want to make the trip up the canyon to the springs, mineral water would be delivered right to your door. The arrival of the railroad to Santa Barbara in 1887 increased the number of visitors, but owners continued to come and go. In 1914, the site was transformed into the private Hot Springs Club with an entry fee of $5000. Another wildfire broke out in October 1921, which completely consumed the club, but members rebuilt. When the Coyote fire roared through the canyon in 1964, it was the last straw. There would be no more rebuilding. The area became part of Los Padres National Forest in 2013 after a fund drive by the Land Trust for Santa Barbara County. Today hikers make the trek up the canyon to view the stone ruins and exotic plantings, the only remnants of the hot springs resorts.